Here are some wonderful customer reviews! Want to be featured on the site and in the news update and help spread the plushie love? Send me your thoughts, reviews, feedback - send me pictures of you with your plushies! I'd love to see them and post them! Izayoi: Touched up hair. DONE! 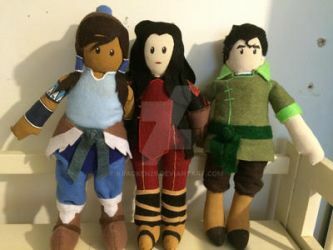 Baby Yasha: Sewed and stuffed arms, attached to body. Finished hair, ears, and face. Finished swaddle and sling. DONE! Izayoi: Finished hair and eyes, started Baby Yasha. Baby Yasha: Sewed and stuffed head and body. Attached head to body. Izayoi: Finished false inner kimono layers. Izayoi: Finished under garments - undershift and hakama pants. Sewed outer kimono. Izayoi: Finished large hakama pants prototype. Finished Izayoi's hakama pants. FINALLY! Izayoi: Worked on hakama pants prototype. I'm hyperfocusing on this pattern because if I nail it, it'll be great for the Suit Yourself Plushies! I've got a bite on it now - just have to finish the prototype and then shrink the pattern for my plushie bodies. 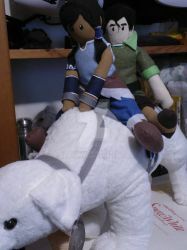 Business: Continued editing/updating plushie pictures from 2012. Izayoi: Worked on underclothes - hakama pants pattern is kicking my can. Business: Posted Meliodas online and on Etsy, updated website store. Izayoi: Worked on hakama pants and under kimono. Bodies: Cut muslin body pieces. Izayoi: Gathered reference pictures, drew up plans, cut muslin body pieces. Finished sewing and stuffing body, attached head, airbrushed flesh tone. Here is my first plushie after becoming a new Momma! Meliodas, the Dragon Sin of Wrath, from the Seven Deadly Sins! Meliodas belongs to Nakaba Suzuki. I have TWO available commissions spots that I'd like to offer to the community! 2. I'll draw up a quote and send it to you. 3. Edit the quote/approve the price. 4. I'll create an Etsy listing. 5. Pay for the listing - THE SPOT IS YOURS! What if I miss an opening? -Let's see how I do with these four spots - if I'm satisfied with my progress, I'll approve more slots and you'll get priority over any orders at CTCon! I have been posting Work in Progress pictures on Instagram/Facebook "stories," so be sure to check those out! COMMISSIONS ARE OPEN BUT LIMITED! Orders are completed in the order that they were received. Please Note: Queue is subject to change based on the difficulty of the plushie or unforeseen life circumstances. As always, I'll let you know of any delays. Keep informed by checking the News section and your email for updates. What's'erFace 101What is a What’s’erFace? A What’s’erFace is a custom-made, felt face or object. If I have a reference picture, I can usually make anything!They come in a protective plastic bag with one of my business cards.Ready-made What’s’erFaces have no backing until you buy it – just let me know what you want your What’s’erFace to be! What can I use What’s’erFaces for? Locker decorationBookmarksConvention lanyard/badge decorationScrapbook decorationEarringsBulletin board decorationCosplay pieceBackpack PinBinder DecorationRefrigerator MagnetHoliday decorationBirthday GiftWedding GiftAny special or every day eventMuch more! On average, they are about 3 inches in diameter and they are flat enough to be used as a bookmark. So and Sew Plushies Commercial! Here's what you can expect from me, and what I would expect from you as a commissioner! Read reviews from awesome people who have ordered a plushie! Fun Videos Featuring So and Sew Plushies! How to take care of your new plushie! Every month, I put out an update to let you know how I'm doing! How So and Sew Plushies got started! WHO'S BEHIND SO AND SEW PLUSHIES? Happy belated Birthday! I hope things are going alright with the baby. Thanks so much! We are doing quite well! Good! I imagine you'll be creating all sorts of fun dolls for your little bundle of joy.